The search engine giant set up a sting operation to see if its suspicions were right, and Microsoft was copying its results. Bing has become more reliable of late, but Google claims that that's because Microsoft is using Google's information and calling it its own. Amit Singhal, who works on Google's search algorithm, says that Microsoft is using Internet Explorer to mine data from people using Google, and then using that data to improve Bing. Google's suspicions were first raised when it started to notice that Bing would often return the same top result that Google would, even in the case of an obscure, misspelled search terms. Bing didn't seem to be correcting the spelling, and yet somehow it was getting to the same place. More alarm bells started to ring when Google started to see an increase in the amount of overlap between the top ten results each search engine would return, as well as the frequency in which Bing brought up the same top result as Google. Google began to suspect that Microsoft was using its Internet Explorer browser to gather information. In order to test out its suspicions, Google put together a trap. It artificially associated nonsense words with legitimate search results, and then asked engineers to try searching for the nonsense words at home using IE. 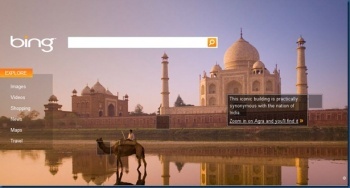 If those words then started to provide the same results on Bing, Google would know that Microsoft was using its data. Of the 100 "honey pot" words, between seven and nine - depending on when Google checked - brought up the same results on Bing. Google isn't sure why the rest of them didn't work, but even just seven was enough to convince it that there was something untoward going on. Singhal was hesitant to say that Microsoft had broken any laws, but did say that he felt that Microsoft was cheating. "We work incredibly hard and have done so for years," he said. "I don't know how else to call it but plain and simple cheating. Another analogy is that it's like running a marathon and carrying someone else on your back who jumps off just before the finish line." Microsoft hasn't directly denied Google's claims, just commenting that it drew data from a variety of sources, as all search engines did. Microsoft said that the experiment seemed like an effort by Google to try and confuse the data and make Bing less effective.